In Denbigh’s early history, “Court Day” was the great social event of the year. Residents and visitors would assemble on the courthouse grounds while awaiting their case. Besides for just attending a court session, residents would gather and socialize, vendors prepared all year to sell their wares, children would play ball in a nearby field and politicians would come out to slap backs and kiss babies. In this tradition, Denbigh Day was begun. 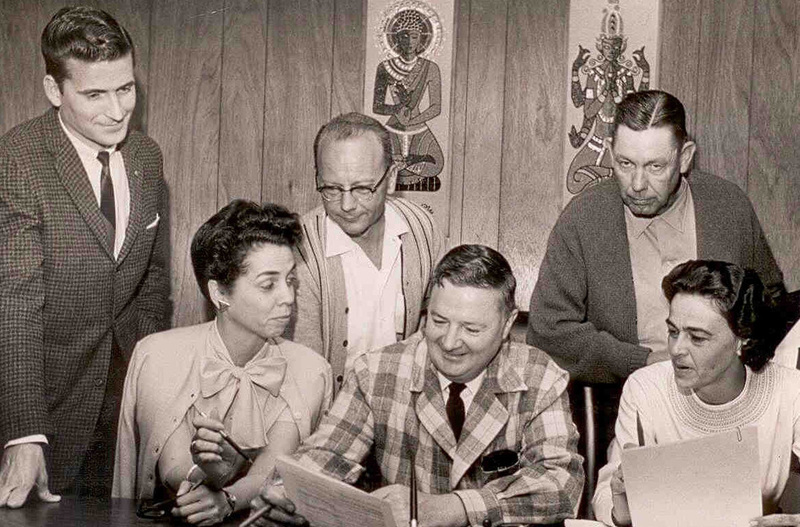 Planning session for the first Denbigh Day 1960; among the planners are Harry Atkinson (center), Wilbur Cary Smith Morton, Jim Griffith... Others possibly June Atkinson, George Murphy, P. D. Trotter... (sources needed). If you were around here in 1960, you would have seen the first Denbigh Day. Sponsored back then by the Denbigh and Stanley civic groups, the festivities began back then with the now traditional Denbigh Day Parade. 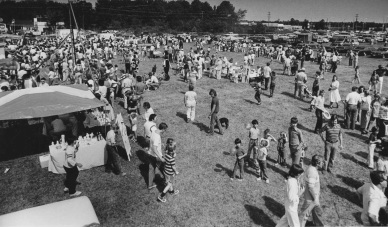 Games, refreshments and exhibition booths were located on the grounds surrounding the courthouse complex on what is now Old Courthouse Way. The illustrious chairman of the first event was a young Harry Atkinson. A picture taken back then shows this dapper gentleman with just a tinge of gray. Nowadays that same pate is completely covered with snow. The theme that day was the official opening of the 18(84) courthouse as a community center. With the annexation of Warwick County by Newport News, the courthouse was no longer needed and was renovated for use by the citizens of the community. A quarter would have gotten you a cup of lemonade and a grilled hot dog. Brownies were two-for-a-nickel and 50 cents got you a homemade cake or pie at the bake sale. For five cents you could have had your fortune told by an “authentic” gypsy, complete with a crystal ball that somehow resembled a bowling ball painted white. Another nickel got you a pony ride on one of Dee Howell’s ponies. While these events were taking place, the Peninsula Orchestra was playing on the lawn in front of the courthouse. The local 4H club had exhibits of their achievements, as well as some prize cows and pigs – off to the side, of course, for obvious reasons. A “risqué” beauty pageant was sponsored by one of the women’s clubs. The contestants were clad in, as they called them in the 1890’s, bathing costumes. From seeing pictures of these bathing beauties, you could make a goodly number of bikinis and still have enough left over for kitchen curtains. There was a nail-driving game for the macho types. Here someone could demonstrate why he was a handyman or show why he called Phil Rea for his home improvements. There was a fish pond for tots where everybody won. There was also a big “White Elephant Sale” with three tables: A one-cent table, a five-cent table, and a 10-cent table. One first day attendee related to me that he bought a set of 1936 encyclopedias for a dime – a real “blue light” special. 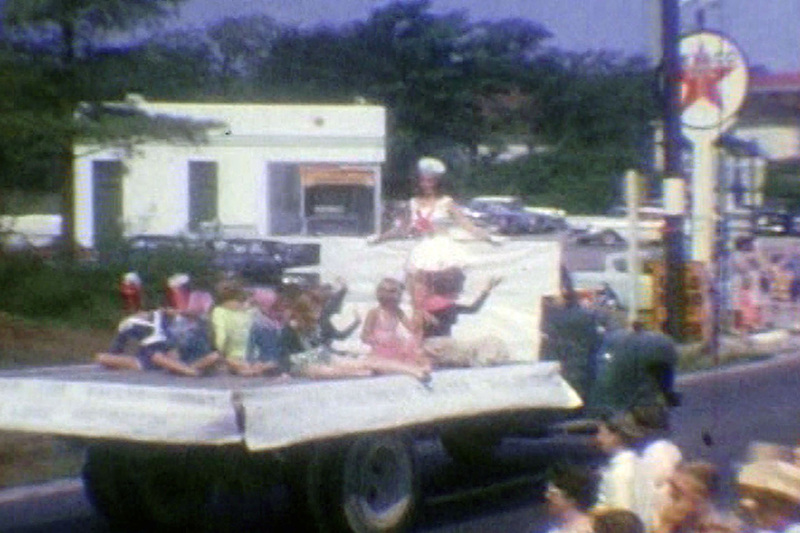 "Red" Johnson as "Sir Galahad" came to the rescue in the 1966 Denbigh Day Parade - thanks Red! store pitched in a $5 gift certificate; and Curtis Motors of Lee Hall fame provided a grease job, oil change and five gallons of gas. Giveaway tickets back then were a nickel a piece or six for 25 cents. 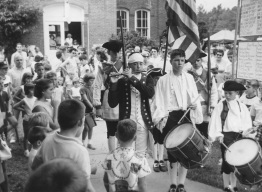 The first parade had among others the Boy Scouts, the local little league teams, a float from the Smith’s Chinchilla Farm down on Warwick Boulevard, men in Civil War attire, and a few years later the infamous sulky (a horse) carrying Denbigh matriarch Mrs. Levy, mother of Denbigh dentist Meyer Levy. This was the infamous sulky that (in 1966) had dry-rotted harness gear. As it passed Red Johnson’s gas station, the harness parted. The horse pranced down the road leaving an astonished Mrs. Levy behind. But not for long, though. The late Red Johnson, being the “Sir Galahad” that he was, picked up the tongues of the sulky and, to the roar of the crowd, toted it to the courthouse. It was a good day from the indications of the after-action report that I have seen. One vendor reported that he sold over 300 hot dogs and could have sold more. The baked goods were gone by 1 p.m., while another vendor sold 10 gallons of lemonade. Still there was one “Oscar the Grouch” in the crowd who badgered the planners to have more onions next time. Well, that’s just some memories of the first Denbigh Day. Come out Saturday and make some memories of your own. This article was written by the late John Curry who was a long time member of the Denbigh Lions and a local historian/storyteller who wrote articles for the Denbigh Gazette. John Curry was the Honorary Mayor of Denbigh but was awarded posthumously as he passed away one month prior to the 2007 Denbigh Day. Denbigh Residents assembled on the courthouse square for court days in the 19th century.